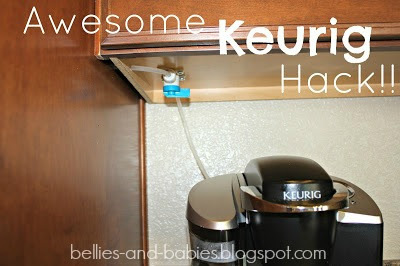 Bellies and Babies: Awesome Keurig Hack!! Friends, my husband is a genius. 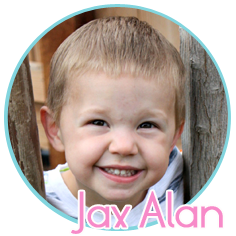 He's super handy and always coming up with good ideas about how to improve things around the house. I'm assuming he's not the first person on Earth to think of this (or maybe he is?? ), but he says he came up with it all on his own. Why not run a water line from the fridge to the Keurig so that we don't have to take the water tank out every time we need to fill it?? After all, one of the main problems with the Keurig and why their life is so short (this is our second one in 3 years) is that the seal on the water tank goes bad. So this solves that problem! Also? We're slightly lazy and this saves us a few minutes each time we need to fill it. Ha. Wanna know how to do this yourself? Well... here you go! I will preface this by saying that your Keurig must either share a wall with your fridge (like in the picture above... our fridge is on the other side of that wall to the left) or be close enough to run a water line to it. 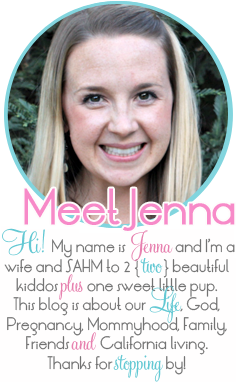 But other than that, this is a pretty easy and inexpensive project! All the supplies were purchased from Lowe's. This is what the back of your fridge should look like. See that water line? That's what we are hacking into. 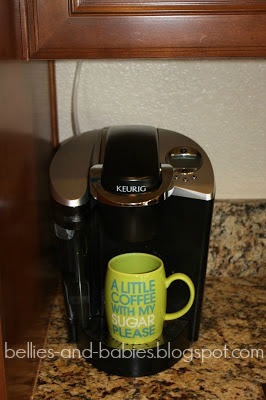 You will need to buy more of this in order to cut it and run to the the Keurig. It's called Polyethylene tubing. Make sure you get the one that is 1/4" OD (outside diameter) and is used for water and ice makers. Get this 1/4 inch tee. Again, make sure it says 1/4" OD. We got this metal one, but the shark bite plastic one I linked to is much more user friendly. 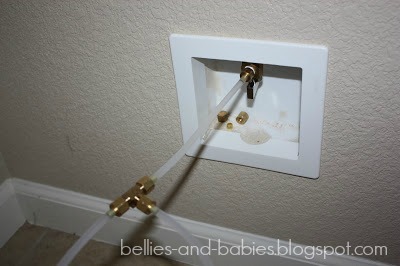 First, turn your water valve off at the wall... don't forget that part!! Using an exacto-knife, cut straight through the tube about 6 inches from the wall. Install the tee according to the directions on the one you bought. Grab your roll of extra tubing and insert that into the tee. Unroll enough so that it reaches all the way to your Keurig. Make sure you leave plenty of extra, just to be safe. 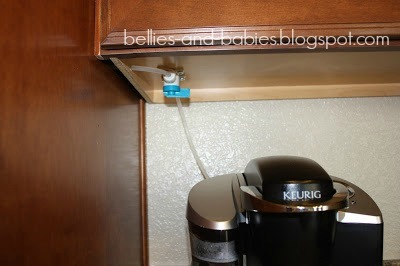 Drill a 1/4" hole in the wall between the fridge and Keurig. Ryan also drilled a small hole in the very bottom of our cabinets, so that the line could run through both holes and not be hanging down and noticeable. Get this 1/4" valve and screw it into the underside of your cabinet with 5/8" nylon clamps and short screws (so that they won't go all the way through to the inside of the cabinet). 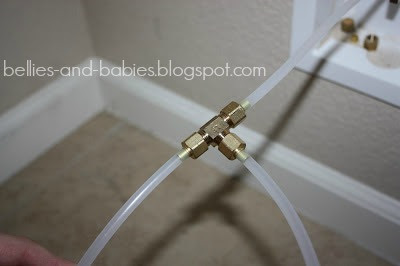 Grab the tubing that you connected to your fridge line and shove the end into the valve. 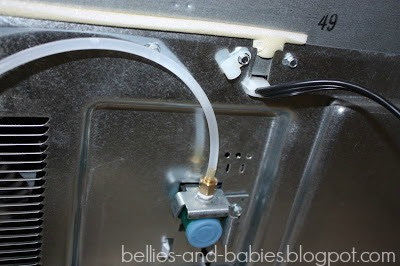 Cut a new piece of tubing long enough to reach from the valve into your Keurig tank. 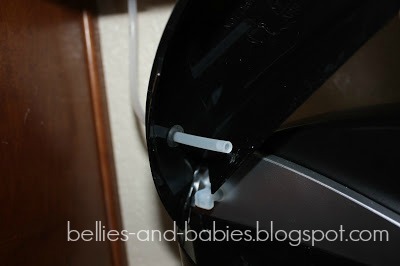 Using a 3/8" bit, drill a small hole in the back of the lid of the Keurig. 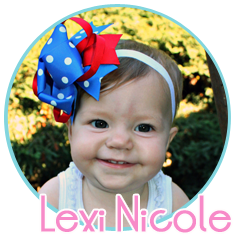 Get this 1/4" ID (inside diameter) grommet. 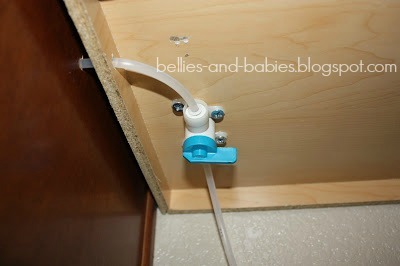 The grommet is important so that the tube stays put when you turn the water on to fill the tank (ask me how i know!). Insert the tube through the grommet, a few inches into the tank. Put the lid on, turn your water back on, and you are GOOD TO GO!!! Here's a shopping list that you can write down and take straight to Lowe's! And you'll also need a small wrench, medium wrench, exacto knife, drill with 3/8" and 1/4" bit, and a screw driver. Nothing too fancy! Let me know if you decide to try this! I would love to hear other people's feedback and experience! 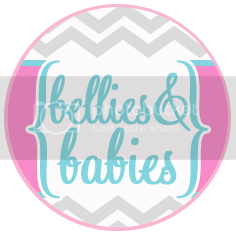 And don't forget to come like my new Facebook Page!